Most people drink, and some people drink too much. In South Korea, with the social pressure to drink with coworkers, there is even more cases of drinking (and over drinking). The result? A hangover. For those not familiar with the ailment, the feeling is akin to a hammer is being continually slammed against your head. Others consider it an overwhelming feeling of fatigue and grogginess that you can't seem to shake. However it resonates, it feels neither good nor invigorating. Regardless of the after-effects, most people continue to booze week after week (even day after day), knowing full-well how they will feel come the next morning. Thankfully, there are a few remedies out there. In South Korea, the answer is (해장국) haejangguk, or the infamous "Hangover Soup." I stumbled upon my first batch (in a similar condition described above) one Sunday afternoon. The word haejangguk actually means "to detoxify," and rightly so. Within minutes of consuming this hot, steamy soup, I could feel my body warming and rejuvenating. I literally wanted to embrace the sprightly ajumma who had served me this hearty stew that seemed to heal my body and all it's ailments. How can such a soup exist? In Seoul, haejangguk mix soybean paste with sprouts (콩나물), as well as radish, cabbage and albalone, and kumbulgunsek, or ox's blood. Usually, the way a hangover works has to do with how the body processes alcohol. The more alcohol that is in your body, the more acetaldehyde is formed. Acetaldehyde occurs naturally in bread, coffee and dried fruit, and is produced by the oxidation of alcohol (this is what makes our hangovers hurt!). Apparently, the healing power of haejangguk soup stems from roots of the bean sprouts. The roots of the sprouts have lots of asparagine, which reduces the acetaldehyde. Bean sprout soup is also good you have a cold because it has tons of vitamin C. Either way, it's definitely a boost for your health. Haejangguk dates back to the Joseon dynasty. Even then, this soup was served to relieve a hangover. After a night of heavy drinking, men would stumble in the early morning to the Haejangguk House to get a fresh bowl of the soup. Thankfully, now you can still find hangover soup at most Korean restaurants. Many places have their own spin on the dish, but the essence of the dish is still the same. Outside of Seoul, many variations exist on this all-curing soup. Jechupguk is a type of haejangguk that uses clams. This variety is quite popular in the Gyungsang province. 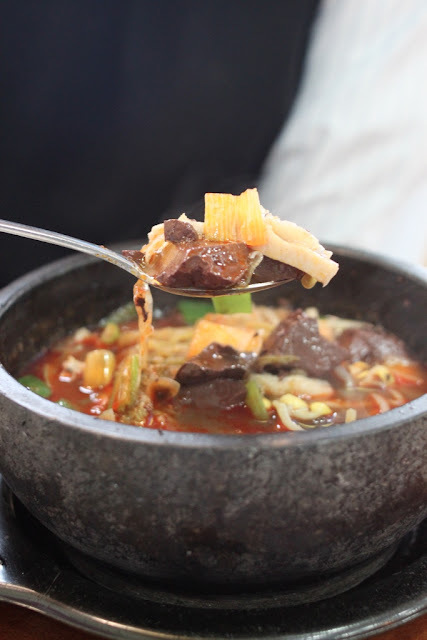 Gulgukbap is a haejangguk that uses oysters, radish, onion, green onions, anchovies, and mushrooms and served in dduk begi, or black pot. In Junju, a type of hejangguk is made with garlic, rice, beef broth, sprouts, and salted shrimp. Regardless of where you live, most countries have a trick to cure a hangover. In Japan, there is ramen and Russia has cucumber juice. In Sichuan, China, they eat carp soup. Even in America, some people swear by eggs, bread, or even cheeseburgers. In Korea, however, it seems that haengangguk seems to get the job done. Just be sure to consume it the morning after, rather than that evening. Lindsey is from Chicago, and generally likes anything vegetarian and Korean. Check out her blog at http://www.teachkoreatips.com.